What is the price of one’s man life? Is it just money or is there more at stake? Beirut asks those questions and brings us into a world that has been debilitated by civil war and is a dangerous place to even visit let alone work in. Jon Hamm (Mad Men) does excellent work alongside Rosamund Pike (Gone Girl) in a story that is penned by Tony Gilroy (The Bourne Trilogy). The locations are beautiful and sad, and remind me of other compelling espionage thrillers. The result is an intricate story that is weaved into an intense thriller with more on its mind that just senseless action. The story begins where Mason Skiles (Hamm) is a U.S. diplomat working in Beirut, Lebanon. He has a lovely wife and has saved a child from the clutches of violence that has been spreading throughout the Middle East for over two-thousand years. Tragedy strikes early in the film, which results in Mason leaving the country until ten years pass where he finds himself back in a place that looks worse than when he left it. He has a drinking problem and is lured back under false pretenses where he now has to negotiate the release of a friend he left behind years ago. He’s good at getting a deal done, since he’s the type of person who can make anything happen. The atmosphere of Beirut is interesting in how the cinematography is set up. There are no fancy lighted sets. The streets are dark, the buildings are in ruin and there is danger lurking around every corner. This is a place where people are used to violence, almost desensitized to it. Mason meets up with a plethora of characters who work for the U.S. Government, but we aren’t exactly sure who. One of them is Sandy (Pike), a CIA Operative who’s working undercover and makes sure that Mason completes the mission. 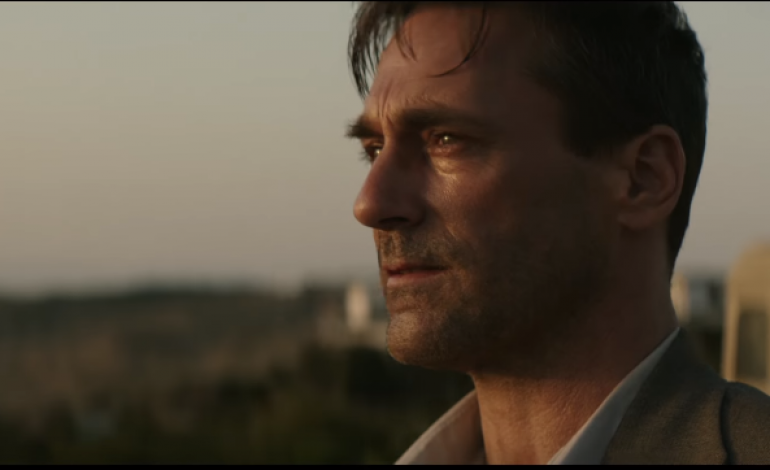 Both Hamm and Pike have good chemistry and hold the film together through their characters. What impressed me most about Beirut is the underlying tone of suspense. It isn’t obvious but it lingers there tugging at you but nothing hitting you in the face. Mason meets with the kidnappers and works tirelessly to work out a deal so that everyone can be happy, but others things are happening on the other side of the fence. Who wants what? What price is acceptable and who will walk away from all of this? There are a lot of questions in this film and it takes its time in answering them. An elegant way to let everything unfold. There has been some criticism in how this film is presenting Beirut as a war-torn country and shows us the people as savages and killers; I didn’t get that impression. Beirut isn’t just a title, it’s also a place where bad things have happened. This film takes place during the real-life Lebanese Civil War. What I got was a fleshed-out story that’s very intricate at first, but unfolds very well. Great performances throughout and a fantastic soundtrack by John Debney add richness to the story. Tony Gilroy continues with a good script and Brad Anderson offers solid direction. I feel that Beirut won’t be seen by many, but it’s a damn good espionage thriller not to miss!